The optical properties of carbon nanotubes and graphene make them potentially suitable for a variety of photonic applications. 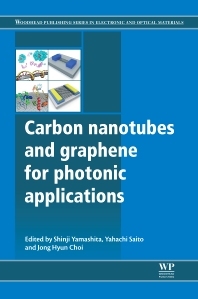 Carbon nanotubes and graphene for photonic applications explores the properties of these exciting materials and their use across a variety of applications. Part one introduces the fundamental optical properties of carbon nanotubes and graphene before exploring how carbon nanotubes and graphene are synthesised. A further chapter focusses on nonlinearity enhancement and novel preparation approaches for carbon nanotube and graphene photonic devices. Chapters in part two discuss carbon nanotubes and graphene for laser applications and highlight optical gain and lasing in carbon nanotubes, carbon nanotube and graphene-based fiber lasers, carbon-nanotube-based bulk solid-state lasers, electromagnetic nonlinearities in graphene, and carbon nanotube-based nonlinear photonic devices. Finally, part three focusses on carbon-based optoelectronics and includes chapters on carbon nanotube solar cells, a carbon nanotube-based optical platform for biomolecular detection, hybrid carbon nanotube-liquid crystal nanophotonic devices, and quantum light sources based on individual carbon nanotubes. Carbon nanotubes and graphene for photonic applications is a technical resource for materials scientists, electrical engineers working in the photonics and optoelectronics industry and academics and researchers interested in the field. Shinji Yamashita is a Professor at the Research Center for Advanced Science and Technology (RCAST), The University of Tokyo, Japan. Yahachi Saito is a Professor at the Department of Quantum Engineering, Nagoya University, Japan. Jong Hyun Choi is a Professor at the School of Mechanical Engineering, Purdue University, USA.